HOW TO USE THE DUVET COVER: 1) Lay the comforter flat. 2) Insert your hands inside and find the two top corners. holding one corner in each hand. 3) With your hands inside the duvet cover, reach down to grab hold of the comforter's top two corners. 4) Holding the top two corners tightly, give it a shake and a fluff until the duvet cover falls down to cover most of the comforter. 5) Stuff the bottom two corners of the comforter inside the bottom two corners of the duvet cover. zip it up at last! 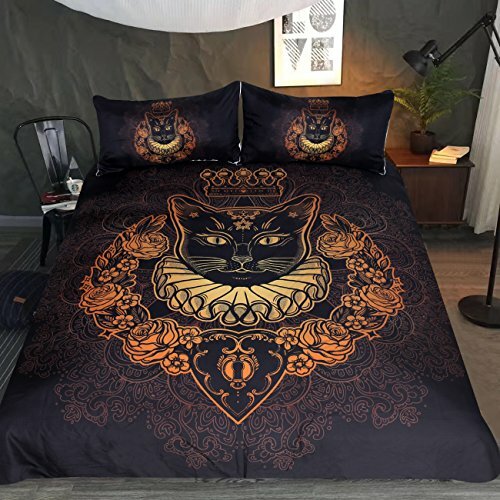 ATTENTION: King set come with one (1) Duvet Cover 104" by 90" and two (2) King Pillow Shams 20" by 36". Set DOES NOT include any INSIDE FILLERS AND ACCESSORIES. QUEEN CAT: This gold zen mandala features a crowned cat, it is truly the most whimsical mandala you have ever saw. SATISFACTION GUARANTEED: Sleepwish is the sole manufacturer of the item. WARNING! Please Check "SOLD BY" SELLER NAME, only products sold by Seller "Youhao" ARE GUARANTEED GENUINE PRODUCTS with 90 Day Satisfaction GUARANTEE. If you have any questions about this product by Sleepwish, contact us by completing and submitting the form below. If you are looking for a specif part number, please include it with your message.